The Stanley Parable is a video game, not a book. 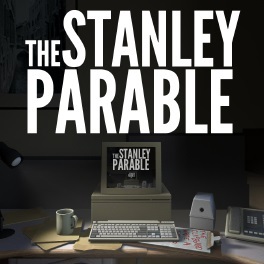 I had planned to stick to reviewing books and graphic novels for this series, but The Stanley Parable was such a storyteller’s story that I couldn’t resist. Some stories don’t tell “a story” in and of itself so much as they are about stories, in general. The Stanley Parable is a game about stories and how we use them to view our lives, and how stories are used to control our lives. It questions the nature of storytelling itself, as a kind of funhouse mirror that both distorts and reveals. The setup is this: A man named Stanley is working in his office when he realizes that something mysterious has happened. He’s perfectly happy at his job, and yet…now that this mysterious thing has happened, he has a few questions. It is your job, as the player, to help him ask them, even though he literally doesn’t have a voice. Meanwhile, a narrator narrates Stanley’s every move, more or less (often less) accurately, in a “Stephen Fry as the Hitchhiker’s Guide to the Galaxy” voice. I recommend it for mature middle-school students and up, and for adults who enjoyed Douglas Adams. Gamers have probably already played this simple, not-terribly-difficult game, but if you find one who hasn’t, it’s almost a sure winner. Thoughtful book recommendations – prose off the beaten path – one terrible pun per month – no questions asked. Wonderland Press Newsletter.